Arguably the jewel in the crown and certainly one of the largest units at The Lowes. Luxurious, Plover House is all on one level in a H shape with generous living space, a large garden room with glass to both aspects, opening with bi-fold doors onto an internal courtyard, making the most perfect, private party area. 5 Star Gold rated by Visit England. The open plan lounge, dining and kitchen area has ceilings to the apex and wooden beams which retain the original character of the barn. A wood burner provides additional heating and is perfect for cozy nights in. The link between the main living area and the bedrooms is a great place for children and adults alike to have their own space to sit and read, play games, or just relax with the bi-fold doors open onto the courtyard. A very versatile space. The kitchen units are made from polished natural maple, and are fitted with an integrated dishwasher, washing machine, tumble dryer and fridge freezer, stainless steel oven, hob, chimney hood and built-in microwave. The tiled floor of the kitchen and sun room merges easily into the wooden floor of the main living area, and has under floor heating throughout. 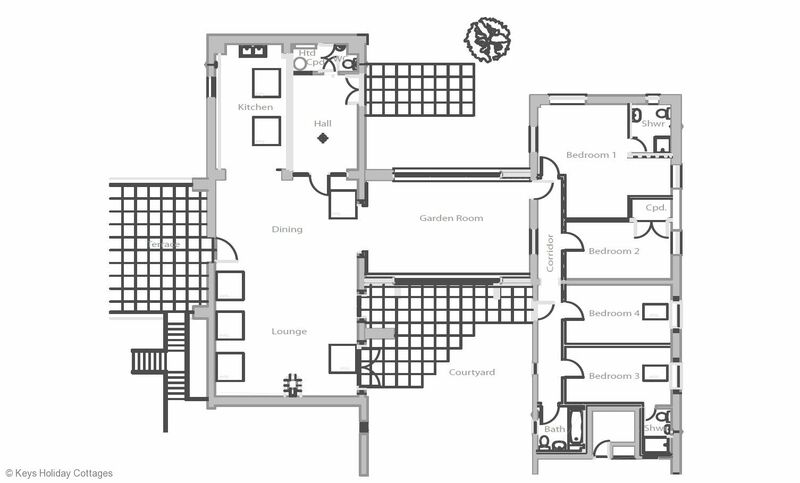 There are 4 bedrooms, 2 King with en-suite shower rooms and 2 twin bedded rooms with a family bathroom. All the bath and shower rooms are equipped with heated towel rails and chrome fittings as standard. This truly fabulous property offers exciting contemporary space, and has access via a terrace to the shared heated, indoor swimming pool complex. In addition Plover House offers a coal BBQ, free Wifi, a Freesat TV, DVD and CD player. Also local information, maps and guides and a selection of books, games and puzzles. We also provide a travel cot, high chair, pool towels, dog bed, bowls and towels and logs for the wood burner in the autumn and winter months. Garden furniture on 2 terraces give plenty of outside options to eat and relax. Please note that this property has an arrival time of 4.00pm onwards.